2014 is over!!! Yes, today is New Years Eve and I can't believe it but extremely glad that it's over!! In 2013 I remember stating that I will be making productive changes in my life for 2014 that would make me a better adult. However, 2014 was another year filled with unexpected surprises and changes; 2014 brought me great memories filled with happiness as well as pain. Even then, the inflicted pain was something I brought upon myself and if I had been more aware and careful someone events could have definitely been avoid. But still, I am deeply grateful that these events occurred since it helped me realized my position on where I stand in life. 2014 has had its ups and downs; but 2014 has been a year I was able to teach myself a lesson to grow up and figure out who I am rather than what I should be. Well, here is a quick summary of my 2014. 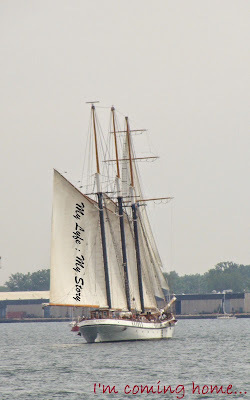 And also, due these events that occurred I have definitely caused a major dysfunction on my blog and sorry for my act of disappearance during this year. In 2013 I had around 137 posts in a year and this year I barely passed 60 posts. During this time, I would like to thank everyone who has stuck on to me til the end! I am deeply grateful for everything, I love you all so much and really wish I could give each and everyone of you a great big hug!! Since I had only a few posts up, I will not be doing my yearly traditional recap posts but instead as promised I have definitely given you a quick treat with my "12 chapter - Recap Series" on youtube! It's a series of twelve video which features a video captured from each of month (from January to December). I had a great time creating this project and would love to give a big shout out to my friends Diana, Maaria, Cynthia and my lovely team at Fashion Weekly Magazine for the help. Each of them has contributed in many ways to create these videos! Take care and also at this time I want to thank all my old readers and new readers for all you support and in the upcoming New Year, I will try to entertain you more with more exciting posts in 2015! This past weekend has been a busy one!! First of all, if you follow me on instagram you would have seen the photos from my sister's birthday party which occurred on Saturday. Then on Sunday, I finally went to my first ever Blue Jays baseball game at the Rogers Center (the old SkyDome). It was really exciting and thank you so much to my brother Hari for taking me there. Also, a huge thank to my younger brother for advicing me to go, since it will one of my greatest moment for this year 2014. To be frank I usually avoided going to my skin allergies and also on Thursday I was able to finally visit a specialist regarding my allergies. I learn alot about my body and learned that I have a rare form that can be caused due to solar waves. I will talk more about this is in one of my future post based on health. Right now, I am at home trying to give myself some time to plan out my future (since nothing is working according to my plans). Anyways, that's all for this afternoon and hope you all have a lovely day!! First of all, Happy Birthday to my sister!! Animal printed trend is not my favourite; however for some random reason I ended up buying at least one leopard clothing piece. Last week, I was able to meet up with my friends for a chat over a cup of coffee. It was a very interesting meet up, since my friends and I ended up matching in leopard print. Other than that, when I purchased this dress I expected it to be short however to my surprise it was actually longer (right on top my knees). At first, I thought about hemming the end of the dress but later decided not to (and it was a great decision). Also, the dress is so comfortable and I think this will be my favourite dress for this summer. 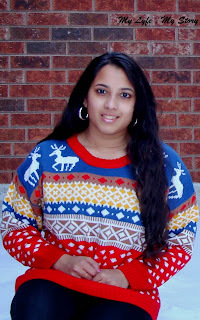 Well, in this outfit post I am curious to find out what you think about animal printed clothing pieces? My sister’s 21st birthday is right around the corner and I wanted to do something special with my nails. Sadly since I have tiny nails, I am never able to do anything special to them (if you follow me on twitter you would have already learned about this). However, to my surprise when Broadway Nails claims when they sent me their Impress Press-On Manicure set for review, I was over the moon. 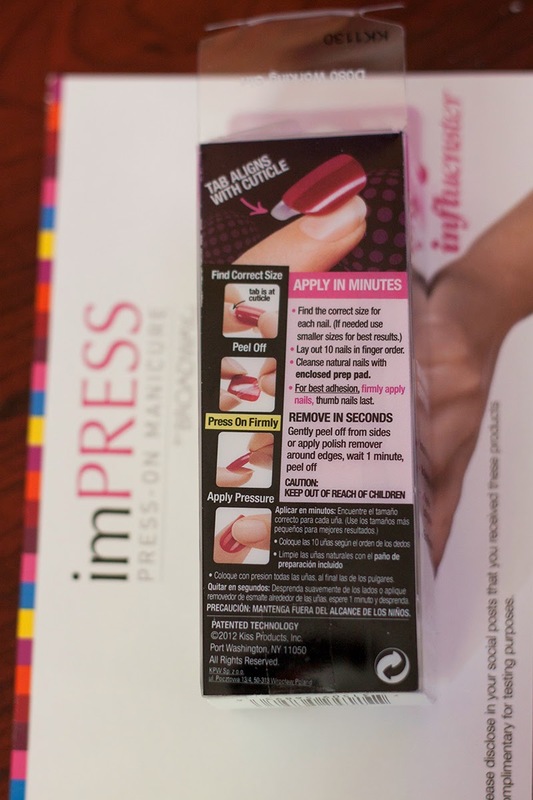 The best parts of these nails are that their drying time is fast and since its imPRESS Press-On Manicure is an instant salon-perfect manicure for which you have to spend zero drying time. The designs are professional, cute and it’s extremely easy to remove (just add nail polish remover). The sad parts are that it only last for a week and the nails are not reusable. The verdict: I love the VoxBox and I tend to have short nails. So this was definitely helpful and I am die heart fan of prints (the two sets of nails I received tends to do justice to it). I will be purchasing more of them for walmart, in different prints and shade. Electric Spark!! Is the perfect name for this outfit post, I don't know if you remember but last year I wore this same skirt and for some reason it wasn't very vibrant. However when I wore it yesterday it look stunning, the colour was just so vibrant. I had to visit my dad's relative and since the weather was beautiful I decided to wear this outfit combo. I have always be afraid of colour blocking with bright colours. Normally I stick to wearing black and white, since I am mostly comfortable in them. However randomly yesterday I can up with this combo, I hae seen this combintion on the runway of Toronto Fashion Week. At that time I didn't believe I could pull if off but I am pretty impressed with the outcome. Anyways, as promised I have posted another outfit post and I will try my best to keep my blog active with two post per a week. It's not a promise but I will try my best to be alive!! Well, take care and have a wonderful day!! Another fashion risk.... especially for me!! Even though this isn't as heavy as my stripped leggings look, this is another particular style of clothing I would have never imagined myself wearing. Growing up I was extremely restricted and as I grew older it has grown with me. However, in the last months I have definitely been confident with myself and started to take some fashion risks. I still remember as a teen I use to look at magazine and question myself on how some people are capable of pulling of these particular pieces. But after a few year (in my early twenties) I have learned for my experiences that it's not the clothing items that makes the individual stick out but rather their confidences. To be frank, right now due to all your support with the great comments, suggestions and tips I learned to careless about what others think about my clothing or my style, but rather I tend to be proud that someone is actually amused with my outfit that they have taken some value time of their day to observe and talk about it. how many of your style has evolved over the years and how did it affect your level of confidence? Since the giveaway had over 800+ entires I want to double the winners, so another two awesome people will be chosen on the day after Mother's Day!! Anyways, that's all for today and I will try my best to have another outfit post by the end of this week, so wish me luck!! Also, hope you all have a great week!! Mother’s Day of this year is May 11th. Are you ready for Mother’s Day? Moms have already got used to greeting cards and carnations. This Mother's Day, why not show mom how much you love her by surprising her with some staff she will put to good use? A piece of clothes chosen by you is definitely one of the best overall gift-giving tips for this day. 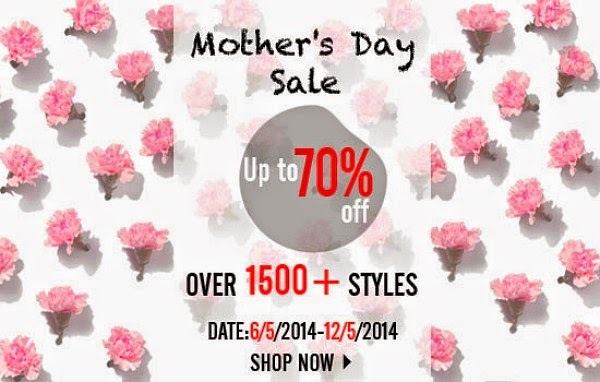 Romwe is going to launch a best sale than ever to celebrate Mother's Day. Give yourself or your beloved mom a big treat with more than 1500 styles. How about sharing this inspiring news with your lovely fans on your Facebook, Instagram and blog, etc as soon as possible? Of course, everything has been prepared. :))) But feel free to change anything to fit your own style! If you are on the look out for trendy clothing this spring, look no further because Zarop has it all. Zarop is an online boutique featuring the latest fashion and celebrity trends .They offer dresses, tops, bottoms, bags and more. 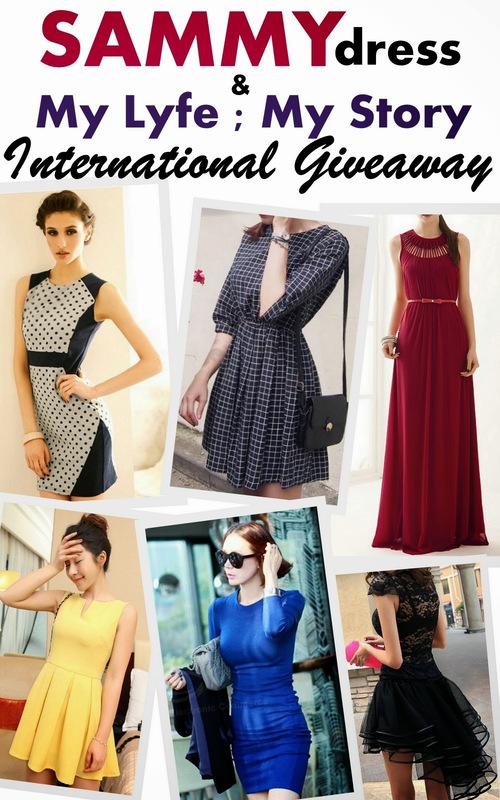 Recently I was asked to run a giveaway for their Stretch Back Hollow Black Lace Dress! It is adorable and available in sizes S-L and in Black. FREE SHIPPING & FREE RETURNS! Shop Zarop on-trend boutique featuring emerging designers and Fashion to covet! 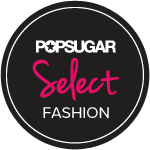 Celebrity Clothing, Dresses, Shoes, Handbags. You can fins so much cool stuff in just few clicks away, you will be ready to follow up the up-to-date fashion trend. Zarop specialized in making Celebrating clothing for women, and also a professional online shop to sell high quality celebrity, trendy, modest, AND affordable Fashion stuff!. Zarop.com major market is Europe, USA, Ukraine, Russia. A little black dress is a necessity in any woman's closet and I was lucky enough to team up with Zarop to bring you a giveaway of the PERFECT, affordable little black dress. While the regular price of $37.00 is really affordable, Zarop will be offering this dress for only $9.90 starting 1am GMT 4/28/14. There will be a limited supply available so be sure to act fast!! One reader is going to win a Stretch Back Hollow Black Lace Dress in a size of their choosing. This giveaway is open until 5/8 ay 11:59 PM CST and is open WW. Winner must complete the mandatory entries to qualify. Completing all entries will increase your odds. There is no purchase necessary to enter this giveaway. Enter below and goodluck. Extra Entries1) Follow me on @MyLyfeMyStory & Tweet about the giveaway (as much as you want)2) Follow Me Instagram (http://instagram.com/MyLyfeMyStoryBlog) 3) Fan Me on Lookbook 4) Follow me via Bloglovin 5) Leave a comment on one of my outfit posts. It's been over a year since I transitioned my blog from a random journal to a full packed outfit diary. Due to it I had an opportunity to see my own changes in how I style my daily outfits to how I present myself. I still remember when first post my outfit post, I was extremely stiff and didn't know what to do. However, after a few posts and your lovely comments/suggestions I slowly was able to open up. Soon after that my style on how I dress to school had definitely changed, I never cared about the way I looked and even now I don't care. However blogging taught me that I don't have to dress a certain way to present myself, but rather just wear pieces I love since they gave me confident. Well, I wanted to quickly put this out there, because this morning when I wore this outfit combo my whole family was extremley suprised with my look. My dad told me that I look extremely confident in this look and I am not going to lie, but I did get a lot of stares from random people. However I wasn't embrassed but I felt proud!! This is one of my biggest fashion risk, since I paired this outfit with two different trends plus both pieces had their own piece of statement. But to my surprise everything worked out as I planned and this is one of my favourite outfit look till this day. So, what do you guys think about this outfit combo and would you ever copy this combo. And also, how would you style your stripe leggings? I can't wait to read all your comments regarding this topic. Well, take care everyone and hope you all have a wonderful day. and for some reason I felt that it worked perfectly with this particular outfit. But, oh, what happened to my peers! since someone has seen the beauty in me. Thank you so much @ReAnGaYa for sent this poem to me!! Also, thank you so much to all my lovely readers for all the wonderful comment as well as the support. I really appreciate it and this week have been extremely hectic so I decided to keep this post simple just like my last few post. 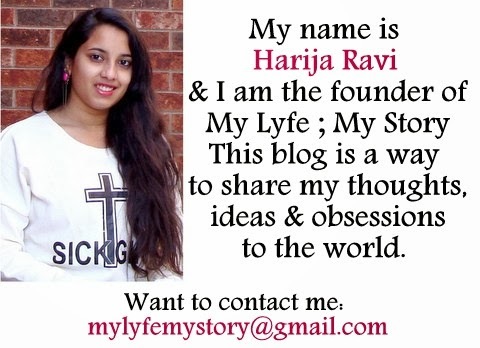 On Monday, I will definitely be back with another post for you all!! Anyways, have a lovely day and enjoy your weekend! !